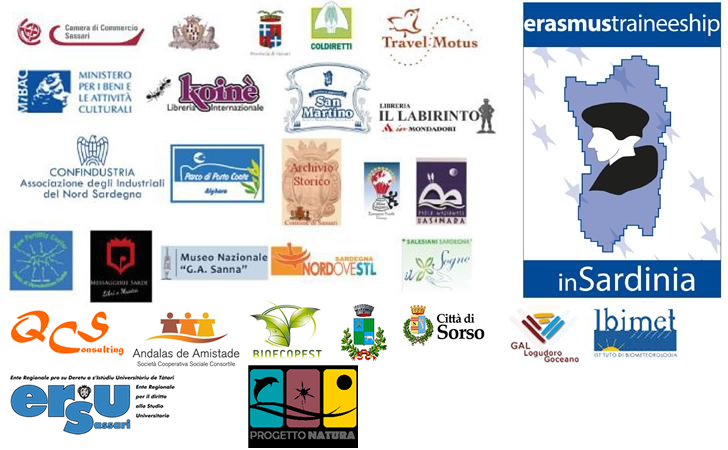 The "Erasmus Traineeship in Sardinia" (ETS) programme results from the cooperation between the University of Sassari, the Provincia di Sassari (Provincial Authority), the Comune di Sassari (Municipality of Sassari) and the Camera di Commercio, Industria Artigianato e Agricoltura di Sassari (Chamber of Commerce - C.I.A.A.). This new programme is targeted at university students enrolled in all the countries participating in the Erasmus+ Programme who wish to carry out an internship in companies, institutions, private offices and agencies of North Sardinia. The ETS call and the list of traineeship available are usually published twice a year and are reserved to university students who have obtained an Erasmus+ Traineeship grant from their university. In each traineeship offer the candidate's requirements, language proficiency, work experience, training activities, the duration (from 3 up to 6 months) and the period of the internship will be specified. Based on the candidate curricula and/or on the results of interviews held via Video Conferencing (i.e., Skype), the University of Sassari and the hosting company/agency will select the suitable applications among the list of eligible students provided by the sending Institution. The selected students will receive a grant by their university for travel and living costs and they should be fully covered by a specific third-party and accident insurance policy provided either by the home institution or by the students. Should the training activities be carried out in a laboratory, the insurance policy must also provide coverage for any accident connected with the use of chemical-biological substances. No financial support will therefore be required to the host institution/company. Also, the University of Sassari will offer your first night stay at a hotel or B&B on the day of arrival, free of charge. JUST STARTED YOUR E+ EXPERIENCE? READ OUR WELCOME GUIDE! THE 2019-2020 CALL IS OPEN! Applications submitted to different email addresses WILL NOT be considered. Please note that the internhsip ID of the selected traineeship (as indicated in the Traineeship list) must be clearly specified in the application. Your opinion matters! Fill in the on-line questionnaire to leave us a feeddback on your Erasmus experience. The questionnaire is available in the following languages: Italian, English andSpanish and must be filled in at the end of the traineeship. This report will provide us with valuable information necessary to improve the Erasmus Traineeship in Sardinia project. Please note that it is also still possible to apply for a traineeship to carry out until 30th September 2019, by choosing among one of the offers included in the file “List of traineeship offers 2016/17”. For further information write to aselis@uniss.it.